There are a lot of free antivirus out there, but most of them are stripped down versions of their paid counterparts. This means that they always lack a few features, or come short in protection. That is not the case with Comodo free antivirus. Comodo free antivirus is a full featured free antivirus, with no limitations. It offers a solid protections for your system against known, and even unknown antiviruses. 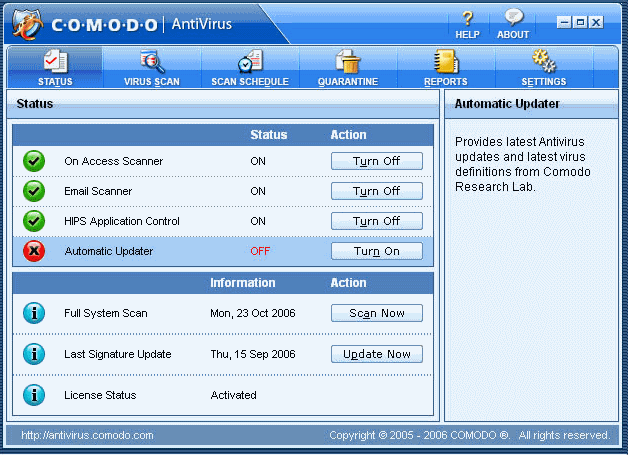 Comodo offers free automatic updates to keep your free antivirus software always current. This ensures that all the new virus definitions are always available to you. This itself is great, as not many free antivirus software offer automatic update feature. Comodo free antivirus scans your entire PC against all known threats. If it finds an infected file, it is safely quarantined, so that it does not infects other files on your computer. Comodo free antivirus can even scan compressed .zip files, where viruses often hide. Another great feature of this free antivirus software is Safe List. Comodo free antivirus includes a mechanism for you, the user, to submit any files you find suspicious to the Safe List. Get immediate feedback on possibly viral files: have any other users submitted it? Or has it already been declared PC-friendly and landed on the Safe List? Instant feedback, from Comodo security experts and other PC-users. Schedule scans as per your needs. One click scan for your PC. Comodo free antivirus is a good free antivirus, and works very well. It does lacks Firewall protection, so you should couple it with some good free firewall. All in all, a good free antivirus to have on your PC. Comodo free antivirus is a full featured free antivirus, with no limitations. It offers a solid protections for your system against known, and even unknown viruses. 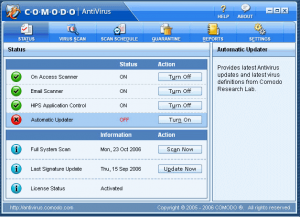 Comodo offers free automatic updates to keep your free antivirus software always current. This ensures that all the new virus definitions are always available to you. This itself is great, as not many free antivirus software offer automatic update feature.